These disposable antiseptic wash mitts have been specially formulated by skincare experts to provide an effective rinse-free cleansing and moisturising solution for the body, all in one convenient mitt. The Chlorhexidine Gluconate ingredient has a dual purpose action which not only kills harmful bacteria found on the skin but also binds to the skin, creating an invisible barrier. Our antiseptic mitts are lightly fragranced, alcohol free and protect the skin from bacteria for many hours after use. Clinicept® Care 2% Chlorhexidine Wash Mitts can be heated in the warmer (or microwave) before use to aid patient comfort. These antiseptic wash mitts are ideal for use in Hospitals, Nursing care homes, or for home-use for the sick or elderly. 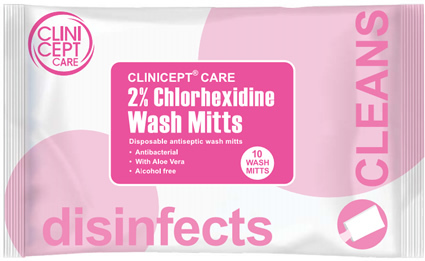 We would like to hear about potential UK & International trade opportunities for Clinicept® Care 2% Chlorhexidine Wash Mitts. If you are interested in distributing this product, please click here to contact us by email.